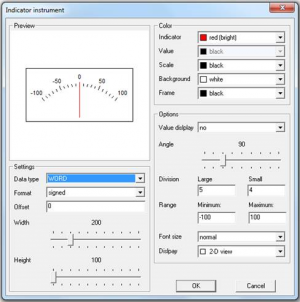 This function block displays a numerical value of the standard data types in an indicator instrument. The parameter dialog can be used to change several preferences. The data type and the size of the function block can be defined. The color of the different components (indicator, value, scale, background, and frame) can be selected. It can be determined whether or not to display the current value and which angle the indicator should cover. The division of the scale in minor and major tics, the minimum and the maximum can be given. Finally the font size for the labels and the general display mode can be selected. By attaching a signal to the input, the function block will adapt itself by changing the data type and selecting typical preferences. This function block has no corresponding target code. During online observation the values are read and represented cyclically.